The Albuquerque International Sunport airport is the largest commercial airport in New Mexico and operates domestic and international routes. Our Albuquerque International Sunport guide includes airport contact details, as well as information on public transport options, terminal facilities, and nearby hotels. The Albuquerque Convention and Visitors Bureau information booth is located by baggage claim on the ground level of the terminal building. From central Albuquerque, head east on Central Avenue SW, then turn right onto the Interstate 25 S ramp. After merging onto the I-25 S, take exit 221 to get on Sunport Boulevard, then turn left. Drive straight to get to the airport terminal. The total drive time should be around 10 minutes. 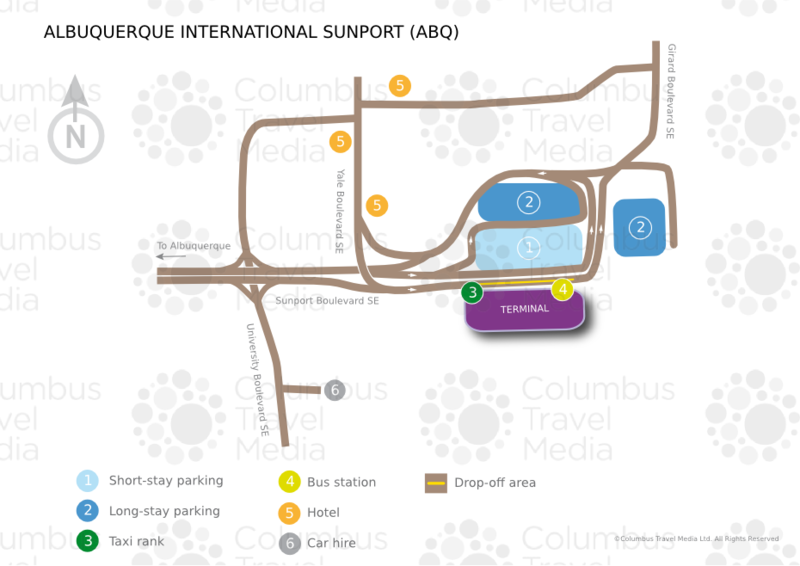 Albuquerque International Sunport is located 5km (3 miles) southeast of Albuquerque. Bus: ABQ Ride (tel: +1 505 243 7433; www.cabq.gov/transit) provides public bus services between Albuquerque International Sunport and central Albuquerque. Catch the 50 bus at the airport’s bus station to ride into central Albuquerque. Standard one-way adult fares are $1. Shuttle: Shuttle services operate in the Albuquerque area courtesy of CLS Transportation (tel: 877 311 2257) and in Santa Fe courtesy of Roadrunner Shuttle & Charter (tel: +1 505 424 3367; www.rideroadrunner.com). Shuttle services to Santa Fe are also available from Sandia Shuttle (tel: +1 505 242 0302). Taxi: Taxis are operated by ABQ Green Cab Company (tel: +1 505 243 6800) and Yellow Cab Company (tel: +1 505 247 8888). The journey time to central Albuquerque is 15 to 20 minutes, and fares start at around US $20. ATMs are located throughout the terminal building. Albuquerque International Sunport has a variety of fast-food outlets, restaurants, coffee shops and bars. There is a good selection of gift shops, specialty stores and newsagents at various points throughout Albuquerque International Sunport. Albuquerque International Sunport has a lost and found office with a 24-hour telephone line. (tel: +1 505 244 7706). The airport offers a prayer and meditation room to passengers. Additional services at the airport include shoeshine stands and USPS and FedEx package boxes. There are no business facilities at Albuquerque International Sunport. However, the Sheraton Albuquerque Hotel (tel: +1 505 843 7000; www.starwoodhotels.com), which is located at the airport entrance, has a fully equipped business centre and a number of meeting and event spaces. Free Wi-Fi access is available throughout the airport. Wheelchair-accessible toilets, service animal relief areas, and TTY phones are just a few of the disabled facilities available for passengers. Lifts connect all levels of the terminal building and the car park, where there are designated spaces for disabled drivers. Shuttle vans are also wheelchair-accessible. A four-story car park, located next to the terminal, provides space for 3,400 cars on an hourly basis, along with an economy lot to the north of the garage that has room for an additional 450 vehicles. A 357-space long-term car park is also available to the east of the parking structure, which is for drivers paying with credit or debit card only. For further information, call the parking information hotline (tel: +1 505 842 7030) or the 24-hour parking administration office (tel: +1 505 244 7883). Car hire companies: Alamo, Avis, Budget, Dollar, Enterprise, Hertz, National, Payless and Thrifty are represented at Albuquerque International Sunport. Offices are located at the Sunport Car Rental Centre, a short distance west of the passenger terminal building at 3400 University Boulevard SE. Shuttles transport customers between the car hire area and the terminal building every five minutes and are wheelchair accessible.